Today's Charms... Tomorrow's Heirlooms. A charm is a sentimental journey you can hold in your hand... to relive precious memories... recall special occasions, for your lifetime and to pass on for generations. Rembrandt Charms is world-renowned for superb craftsmanship and a stunning collection featuring thousands of charm styles. Only Rembrandt has earned the title, The World's Largest Charm Collection by offering each charm style in five different precious metals; sterling silver, gold plate, 10k yellow gold, and 14k yellow and white gold. Rembrandt is a family-owned business that has been designing and manufacturing charms and charm bracelets for over 40 years. Each charm is hand-polished and comes with a lifetime warranty. 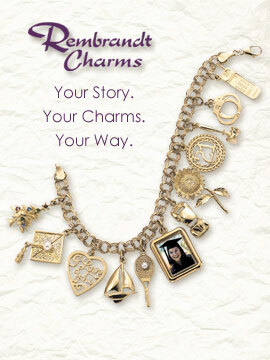 Rembrandt charms are sold through fine jewelry stores, visit www.RembrandtCharms.com to find one near you.